Twenty-three volunteers from Wayne Township, Pic-a-Fay Fire, Jefferson Township, Concord-Green Fire, and Washington C.H. Fire were in attendance July 8. After the morning classroom portion, the training continued in the fire behavior trailer. In the high heat of a blazing fire the contents inside of a burning trailer swell and spew off gases into the air. As gases build and the heat intensifies, a group of volunteer firefighters studies the fire and accumulating smoke for signs of rollover. A rollover is where gases ignite near the ceiling; if they do, it’s a foreboding symbol and the last sign that a flashover is about to occur. 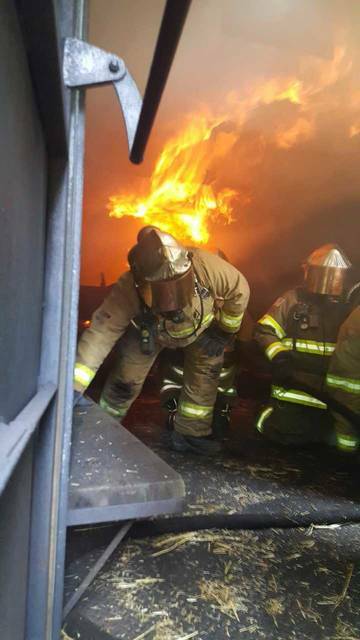 A flashover, according to Chris Wysong, chief at the Wayne Township Fire Department, is when a sudden explosion of flames spread rapidly through the air. It’s important for firefighters to be alert; at this point, the intense fire can engulf people and burn through their clothing. The nature of firefighting has changed over the years, said Wysong, mostly due to the way fires grow in different circumstances. Today the risks are higher and the training is more rigorous. 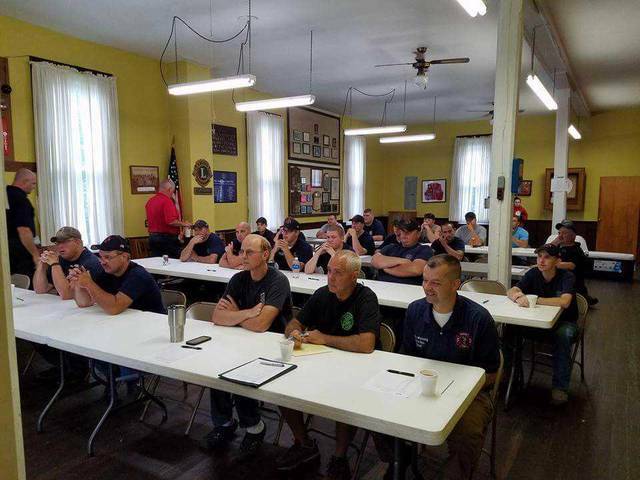 Volunteer firefighters must complete training and pass a state certification test before they can serve in their communities. The changes have made it harder to find people interested in serving as volunteer firefighters, said Wysong. The Wayne Township Fire Department is actively looking for volunteers to fill positions. To help current volunteer firefighters in Fayette County learn about the key elements of flashover, including high heat, growth-stage fire, changing conditions, and rollover, Wysong and the rest of the Wayne Township Volunteer Fire Department hosted a hands-on training event Saturday, July 8. The fire department invited the Ohio Fire Academy to bring a mobile Fire Behavior Trailer to Fayette County to do the hands-on training. 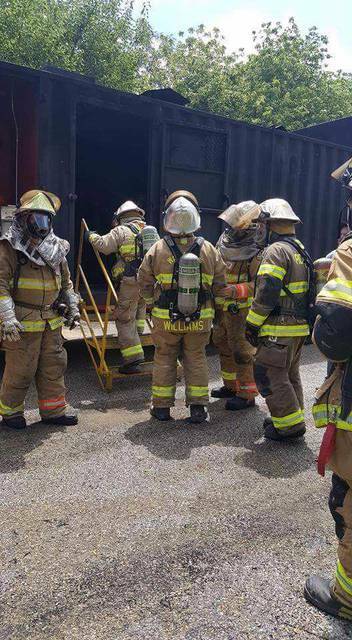 “The trailer provides a controlled environment for the firefighters to witness fire spreading to the point of flashover,” said Wysong. Twenty-three volunteer firefighters completed the training. Wysong said the volunteers came from Wayne Township, Pic-a-Fay Fire, Jefferson Township, Concord-Green Fire, and Washington Court House Fire departments. Wysong works with the Ohio Department of Commerce for grants to cover the cost of training. “In the last three years, we have received over $20,000 in training at no cost to our taxpayers,” said Wysong. Wysong said the hands-on training is critical for volunteer firefighters and is already planning for the next county-wide training event. “Everyone went home with a little more knowledge than when they arrived and I am very excited for that. I am proud to see these members volunteer time out of their busy schedules to improve their education on the changes in firefighting, and now they will go back to apply this knowledge in the services to their communities,” said Wysong. Those interested in becoming volunteer firefighters must submit an application prior to training, said Wysong. Wysong said anyone local to Wayne Township who is interested in becoming a volunteer firefighter may contact him directly at wtvfd201@gmail.com or stop by the Good Hope firehouse the first Tuesday of the month at 7 p.m.
For more information about fire behavior, Wysong said Capt. Homer Robertson with the Fort Worth Fire Department has published several informative articles in Fire Rescue magazine (firerescuemagazine.com). https://www.recordherald.com/wp-content/uploads/sites/27/2017/07/web1_Fire3.jpgTwenty-three volunteers from Wayne Township, Pic-a-Fay Fire, Jefferson Township, Concord-Green Fire, and Washington C.H. Fire were in attendance July 8.
https://www.recordherald.com/wp-content/uploads/sites/27/2017/07/web1_Fire2.jpgAfter the morning classroom portion, the training continued in the fire behavior trailer.